The Vacuum Velocipede is a very special cycling apparatus. It is graced with another nice name for a recumbent, and is a spectacular parade trike. Certainly a unique machine, with a somewhat unconventional layout even for a recumbent trike, the Vacuum also has a very interesting drivetrain, and a steering system that may defy explanation. Riding this machine is a challenge, although it can be done. But perhaps a better question to start with is why? What was the objective? What design criteria were satisfied, if any? And what would inspire such a creation? I had a glorious college career, and graduated in record time. And it was during that 15 year period that I was fortunate to share a house for a short time with Dave Berkstresser, who was soon to graduate as a mechanical engineer. When Dave went to watch the International Human Powered Vehicle Association races in the fall of 1980, he returned to school extremely excited about the potential of human powered speed, and was very interested in maneuverability. Dave had observed that there were some exceptionally fast bikes participating in the various events, but that they generally were not very maneuverable. There was also the problem of starting and stopping, which usually required additional assistance. And it was these observations that provided some of the inspiration for Dave's unique design. Dave's initial design criteria included hoped-for high speed capability combined with some measure of maneuverability. It wasn't that Dave was focused on extreme maneuverability at high speeds, but he saw no reason that a machine capable of setting a human powered speed record shouldn't also be able to perform a U-turn on a two lane street or in a driveway, much like a conventional bicycle. It was about this time that the first truly programmable calculators had appeared and, providing an early glimpse of the true engineer that Dave would become, he began to draw on everything he had learned so far about analyzing mechanical systems, including dynamics, kinematics and advanced engineering mathematics. Dave developed the algorithms and wrote programs for his new calculator that would help him determine steering geometry, and he would let the programs run for days at a time, examining each potential solution. Sometimes drawings were prepared that reflected the solutions obtained, and the visual representations of the various calculations proved to be quite interesting. It was like nothing we were familiar with, but the design that began to appear most reasonable was a tricycle configuration with one wheel in front and two wheels in back. The so-called head tube angle for the front wheel was a laid back 10-15 degrees. The two rear wheels were cambered inward at the top when headed straight, but would sort of lean into the turn when steered. The implication was that there was would be some combination of leaning at the front and steering from the rear to achieve the desired course. It quickly became apparent that a prototype would be required. Some old three-speed bikes were scavenged for wheels, tubing and other components, and Dave had a workable prototype before school resumed after the Christmas holiday. There were the typical prototype issues associated with chainline, frame alignment and, of all things, lateral wheel strength. But the trike would roll, and while there was a challenge in learning to ride it, Dave immediately demonstrated that the machine possessed exceptional maneuverability by perfoming a U-turn in the driveway. It seemed that tight turns were possible, and the machine was affectionately dubbed the Redundant Recumbent. The early steering control configuration featured two vertical levers, one on the right and one on the left, and operated in a push-pull fashion. One lever controlled the lean while the other lever steered the rear. As you pushed the right lever, the bike would lean to the left. Returning to an upright position required pulling the now extended lever towards you, trying to overcome that portion of your weight which was still trying to fall to the left. If you were too successful, you would find yourself trying to keep the machine from falling to the right by trying to force the lever, which was now very close to your chest, further away from you. This system proved to be a hard to master, as the correct amount of input for each lever just wasn't intuitive, especially when presented with a panic situation. I suppose that what also made this system hard to master was the different feedback received from each lever. Steering the rear with the left lever seemed almost effortless while controlling the lean with the right lever was physically hard. The house we were renting was located in a neighborhood near the bottom of a long canyon road. Since the trike would roll and was obviously maneuverable, Dave decided to take it to the top of the canyon and coast down for some extended test rides, without having to worry about traffic or keeping the chain on. This initial coasting experience proved to be very enlightening. The first trip down the canyon showed the limitations of the basic design, when the rear wheels began a sort of speed wobble oscillation at about 15 mph. The mode was very much like the wobbling of hospital gurney wheels, and quickly became quite pronounced. The view afforded those of us who were following the trike was a bit disconcerting, as it looked like a serious crash was all but imminent. Dave was able to slow the machine, and the wobble quickly subsided. This wobble effectively limited the early top speed of the machine, but the concept seemed to work, and besides, there weren't any injuries. We all took turns coasting at speed and experiencing the motion, and took occasional pleasure in allowing unsuspecting test riders to discover for themselves the seemingly benign Redundant's bad behavior. Short forays into our surrounding neighborhood brought out other weaknesses. On one test ride during a sharp turn, the front wheel collapsed. Lateral loads on the wheels were obviously extremely high, and Dave was soon back at the drawing board. Not to be limited by what was available, Dave designed and machined his own hubs, eliminating the hub flanges by providing spoke holes in the hub body itself. With a much wider spacing of the spokes, Dave's hub proved to be more than adequate for the loads sustained by the wheels, and was carried through every subsequent design iteration. Dave had a number of ideas about power, and how it could be better applied to human powered vehicles. As a result, the drivetrain itself has been through multiple iterations. One version of the Vacuum, dubbed the Repugnant, hosted a linear track drive, which can best be described as being similar to rack and pinion steering. Dave built a front hub that included built-in freewheel mechanisms for pinion gears on both sides, and machined his own gears making the track gear about 18 inches long. One end of the track was connected to a crank arm which had more of an arc shape than the elbow shaped arm of this later version. 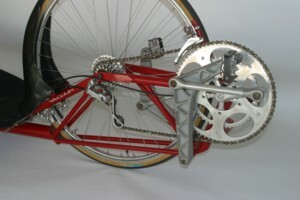 The crank arms were hinged where they are now, and gearing was to be provided by changing the track attachment point on the crank arms. The system worked fine as a single speed drive system and it was possible to manually change gears while stationary, but when it came to designing a suitable gearshift mechanism there were other things that required more attention. One nice feature of the track drive system was that power could be applied with one leg only, and it was also possible to apply power without having the mechanism travel through a complete end-to-end pedal cycle. But the version of linear drive presented here results in very high pedal accelerations at the end of each stroke, and I find it very tiring on the muscles when trying to anticipate the motion and ease the transition from pedalling forward to back and reverse. One other disadvantage with the linear drive is that the motion is somewhat one-dimensional, and by this I mean that the same muscle group seems to be in use all the time. With power being applied in the same manner as doing a leg press, muscle fatigue is quickly apparent. The linear drive system also has a natural cadence, a natural rhythm similar to the frequency that a person can jump, and it can be very hard to pedal more times per minute. But the muscle group that is involve in doing a leg press is the perhaps the strongest and as such it seems that there is no limit to the top gear. The only things that appear to limit the top speed of the machine are the rider's fatigue in getting up to speed and the selection of gears. And the pedalling motion can be a bit tricky to get started if the linkages are toward the end of the stroke. The drivetrain would probably perform a bit better if it had enough rotating mass to act as a flywheel providing some additional momentum to carry the linkages through the inevitable dead spots. The Vacuum's details show Dave's considerable engineering talents. When available components were inadequate, or parts were required that didn't exist, Dave would make his own and he immersed himself in every project to learn materials, and processes, to develop tooling and techniques. He designed a steering damper, cast his own crank arms and made most of the drivetrain components, machined his own chainrings, made the molds for the fiberglass seat and fairing. Dave even sewed his own upholstery, and anodized aluminum parts in the driveway. On the marketing side, the Vacuum was advertised in the Sharper Image catalog in the mid 1980's and, if I remember correctly, more than 300 requests for information were received. I believe that of the approximately 30 Vacuums that were sold, most were sold in kit form in order to keep the costs down, but with all of the unique components the cost was still high. This particular bike actually graced the cover of the Hamacher-Schlemer catalog, and sported a beautiful fairing, with stylish wheel covers that were black on one side and red on the other. Unfortunately, the fairing was destroyed when the trike blew off the roof of the car during a road trip. Initially, riding the Vacuum just doesn't seem possible. The Vacuum doesn't want to stay upright on its own, and what sort of a tricycle requires rider effort to remain upright when stationary? I usually offer interested observers the chance to sit on and perhaps ride it, but most decline to continue when they find that the leaning control eludes them. In fact, one of my friends has the shortest ride on record, and I think I'm being generous in estimating that his ride lasted all of about 3/4 of a second. The best description of his experience would be that he was immediately ejected. Forcibly ejected. And it didn't appear to any of us observing that he had even begun to roll. Injuries were minor, and his record still stands. The key to riding the Vacuum is that it has two separate steering inputs, which must be balanced according to the forward speed. The underseat handlebars are used to both control the lean position, and to steer the rear. Initially a bit confusing, the handlebars are held fixed in the vertical position, but free to rotate horizontally around a vertical axis. At slow speed, the rider can use the handlebars to steer the rear of the bike, much like the long fire truck with an additional driver steering the rear. At at high speeds, the front half of the bike is leaned to steer long graceful curves. At intermediate speeds, correct handling is achieved by a combination of steering and leaning, and this is where it can get tricky. A big steer combined with not enough lean can eject the rider to the outside if speeds are high. At lower speeds, a big lean combined with not enough steer can dump the rider to the inside of the turn. Initiating, and maintaining turns are one whole skill to master, but it is the unturning that can cause real problems. Lean too much and most novice riders will attempt to use arm strength to return themselves to an upright position, but the underseat handlebar position doesn't seem to lend itself to such use. Developing the proper technique appears to depend as much on luck as it does on avoiding early crashes. Panic slowing in turns will cause the dreaded turning dive into the pavement, and novice riders will sometimes try to stop the dive with a hand on the pavement. With any forward speed at all this can be a very bad thing, and gloves have been recommended for initial test rides. If forward motion is occurring, then the rider must steer the rear such that a balanced turn is achieved that effectively stops any lean. The correct method is to sense both the speed and the amount of lean and then steer the back wheels to a point where the forces on the rider become centered if not manageable. Someone once described it to me, after they had mastered the mechanics of riding, as being the reverse of a conventional bike, but I find it surprisingly similar. On a conventional bike, most riders countersteer without thinking about it, by initially steering away from the desired turn, and this causes the bike to begin to lean in the desired direction. Returning to straight and level requires an initial countersteer into the turn, and the Vacuum responds in a similar way. Input a bit of rear steering in the opposite of the desired direction and the correct lean is much easier to initiate, and doesn't require huge amounts of arm strength. Correctly balancing the control input can allow the rider to achieve very sharp turns at high speeds. Incorrectly balancing control input at high speeds will not be a pleasant experience. As the Vacuum gradually evolved, the design was finalized around 24 inch wheels, which allowed for conventional cranks, and a more conventional drive system. Without the requirement for the crank arm hinge point, the frame structure required to support the hinge points could be eliminated, resulting in increased ground clearance. Not ever having had the pleasure to ride the finished product, I can't say if the handling has been improved, but I did get a chance see one up close and I liked the changes. The Vacuum is great for demonstrating maneuverability at speed, and it sure is cool. It feels weird snaking around, turning from the rear, and it is similar to the tadpole trike design popular today. Climbing aboard, it feels like you are inside the machine, and every time I ride the Vacuum, I am reminded of the feeling of the teacup ride at Disneyland, where the motion sensed is opposite of the visual cues available. The Vacuum as presently configured doesn't really lend itself to everyday use, such as commuting, or even for short recreational rides. This shouldn't be surprising as it was conceived as a speed machine. And I still find that it requires a lot of physical effort to perform controlled forward motion. The bike is usually only brought out when a good friend pays a rare visit and wants to try riding it. Recently, Alan mastered the bike in about 20 minutes, and it seemed that we couldn't get him off it for several hours. It remains a neighborhood bike, suitable for sharing, show and tell, and the occasional parade. Over the years I have learned that the bike performs best during that brief period when the roads have been cleared and the parade has not yet started. This allows for spectacular demonstrations of the machine's capabilities for both flat-out high speed and quick maneuverability, to sometimes wild applause. One other good thing is that the Vacuum provides a nice platform for watching the parade after all the exertions. As for commercial acceptance, this machine is perhaps another example of being too early to market with a concept, maybe too early with something new. The Vacuum was an early recumbent trike, before the recumbent market was very well developed, except for fans of human powered speed. I don't know if the Vacuum ever set any speed records, but it was an original low racer, and has obviously helped to further advancements in both human powered speed and in future recumbent developments. A slightly modified steering geometry was adopted by a company that made a front wheel drive, one-speed, coaster brake recumbent tricycle for the beach rental market. 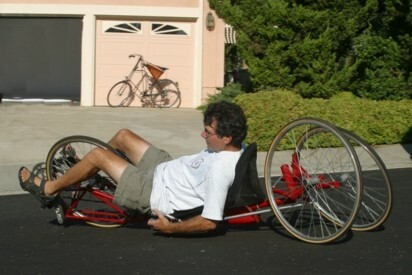 Recumbent handcycles have also been produced using a similar steering geometry. And as physical examples of creative problem solving become less apparent in today's computer assisted world, Dave Berkstresser and the Vacuum Velocipede provide another brilliant demonstration of what is possible with inspiration, imagination and effort.